In the world of pleasure craft, magnificence in itself is nothing new. Not even the preciousness of every tiniest detail can amaze. What makes Moneikos special is that luxury notwithstanding she manages to emanate an intimate family atmosphere. Full load displacement: 890 t.
Propellers: Schaffran 6 blade "S Class"
Design category: Lloyd's Register, 100 A1 SSC "Yacht" Mono G6 LMC Rina 100-A-1.1 "Y" - MCA Compliant.. In the most widespread kind of yachtsman mentality, two years to build a vessel would be an unbearable waiting period. But for superyachtsmen those 24 months are the flash announcing the realisation of a dream, just like in the story of Aladdin's Lamp. To get some idea we need only imagine a 62 metre ship that takes on her finished form at the rate of 8.5 centimetres a day. But this sort of imagining is quite unnecessary for the craftsmen at the Codecasa shipyard who, precisely with such constancy, succeeded in creating that triumph of design which is the motoryacht Moneikos. 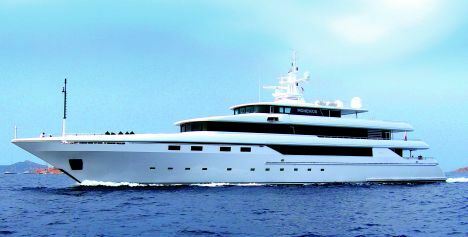 Everything began with the owner of a 50 metre yacht built by the same Viareggio yard. 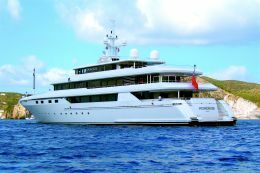 Seeking more space and comfort for himself and his guests he commissioned a 62 metre from Codecasa. The next step, strategically fundamental, was taken in the design rooms where the yard's engineers worked in close contact with the architects of Studio Dellarole, especially for the exteriors, and with their counterparts at Studio Dedalo for the interiors. 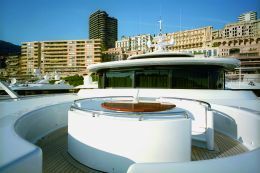 The halo of confidentiality that had protected the gestation of the project and the entire building phase - codenamed "C 112" - was dissolved on 7th June 2006 when the yacht slid into water for the first time, to the ecstatic appreciation of guests at the launching ceremony. For all its innovativeness, the design of Moneikos also completes a stylistic itinerary that began some time ago. We recall for example the other 62 metre, Ipogee, whose exuberant thrusting bow is detectable here, together with the development of the bulwarks and the elegant progression of the overhanging parts of the upper decks in relation to the extension of the great sloping stern. On this tried and tested architectonic base we find, on Moneikos, those dark strips that conceal, in the same colouring, the vast rectangular windows and punctuate the levels of the superstructure, giving it a vague ziggurat look. 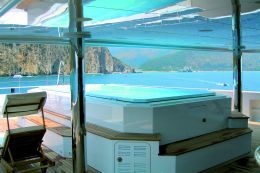 The need for a large volume of living area can be seen from the fact that the sundeck is about 60 percent covered: a solution by which the bridge and the captain's cabin are completely protected and the former is situated at the point of greatest visibility. Moreover, great space was obtained for the spectacular gym, but without sacrificing any of the private or more prestigious areas developed on the decks below. 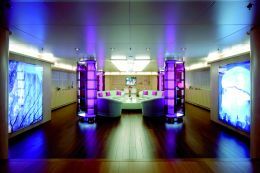 The gym's two large sliding doors open onto the spacious sunbathing area set around a pool equipped with a continuous flow generator, so you can swim while remaining perfectly still. On the subject of privacy, the owner's large suite is on the upper deck, i.e. immediately beneath the sundeck. The suite has been rendered extremely functional for a family life that may, if desired, be lived fully independently of the rest of the ship. 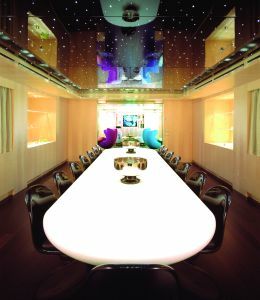 This is coherently reflected in the other spaces on the same deck, as in the case of the main dining room which, sumptuous as it is (it seats sixteen), offers an atmosphere of special intimacy, evocatively conveyed also by the optic fibre micro spotlights that turn the ceiling into a starry vault. Meals are prepared in the great professional galley on the deck below and sent up by a silent dumbwaiter. We now come to the main deck, the largest and most frequented. The focal point of the great saloon, where guests are received on coming aboard, is a precious pair of semicircular sofas. 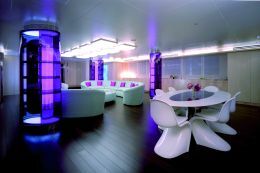 Though it is luxurious and intentionally spectacular, the environment is nonetheless easygoing and youthful. 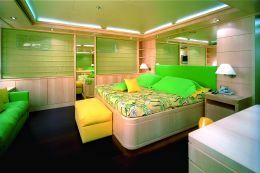 The section from amidships to bow is subdivided into three guest cabins, a babysitter's cabin, a laundry, a dining room and a relaxation room, the last two for kids only. 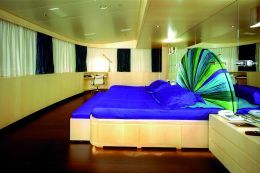 Most of the staff cabins and their mess are on the lower deck, separated from the second guest zone which, in turn, consists of four spacious cabins with private bathrooms. On the same deck, but with access from the technical rooms and the aft bridge, there's a large garage housing two sophisticated Novurania tenders: one a nimble 5.40 metre, the other a more demanding 7.40 metre craft. And speaking of accesses, the four decks are served by a lift and by a series of judiciously placed stairways, outstanding among which is the fine spiral staircase set amidships. The engine room, technological heart of this Codecasa 62, houses a pair of 2.450 HP Caterpillar 3516Bs that give Moneikos a maximum speed of 17 knots and an economical cruising speed of 14, with a range of no less than 6.000 miles. A range which, over and above the typical ratio between fuel reserve and hourly consumption, is also guaranteed by the generators (3 Genset Caterpillars of 145 kW each, plus a fourth emergency generator of 84 kW) and by the desalination system which keeps the 30.000 litre reserve of drinking water almost constant. Equally refined is the repertoire of materials used for building, fitting out and accessories. The hull is in AH36 steel and the superstructures in the lighter aluminium 5083. The two metals were bonded with special joints which render them absolutely compatible. Then there are precious woods such as African wenge for the floors - dark coloured and lightly veined with yellow - and light coloured maple for the wall facings. The ceilings are hand lacquered. The bathrooms, rigorously one-colour, differ one from the other in the selected pastel shade, which contrasts with the precious back-lacquered glass used for the horizontal surfaces. These details do not, like the others, contribute to making the Codecasa 62 conform with Lloyd's, RINA and MCA regulations, but they do make this vessel a new model of wholly Italian craftsmanship.